Aransas Bay is a large bay located between Rockport and San Jose Island. 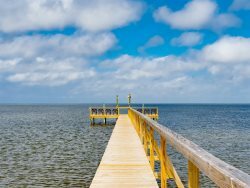 Relatively deep in the middle, Aransas Bay features a large number of oyster reefs dotted through out the bay, with most being in the northern sections that lead into St. Charles and Copano Bays. The eastern shoreline of the bay features large grass flats and tidal lakes.